OK, OK, OK, I’ve received all the fan mail telling me to stop writing about politics and get back to the interesting stories. I tried all day yesterday to have something interesting happen to me, but to no avail. It was just another rainy/foggy day in Maine. So, with regrets, I am going to have to recycle an old story. An oldie, but, I hope, a goodie. When I got out of business school, I joined a mid-sized (~200 employees) public company as their head of business development. As the story develops you’ll see why I’ve opted to keep their name out of it because it was never clear to me who paid the bill for this story. In any case, my liberal friends and relatives will relish the corporate excess this story tells. Soon after I joined the company, I had a business trip with a few colleagues to Chicago. Yes, the same trip where I got my first ever foul ball at a Major League Baseball game at Wrigley Field. The CEO of the company and his wife (and his son who was my boss) loved food. They were the epitome of “foodies.” They would literally travel the world just to try a new restaurant. In fact, the CEO and his wife were flying into Chicago primarily to have dinner with us. 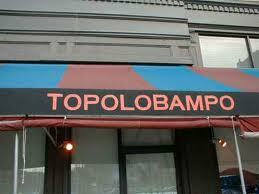 On this particular night, we had reservations at Topolobampo, one of the top Mexican restaurants in the country. Very high end stuff. The reservation was for 8 PM. There were 4 of us who had been in Chicago for a few days, including the CEO’s son, Jake. The CEO and his wife were flying in just in time for dinner that evening. One of the 4, our head of R&D, had to fly out before the dinner at Topolo so we decided to go out for a beer with him around 6 PM before he had to go to the airport. When we arrived at the bar, Jake suggested we get some bar snacks. Sounded good to me. I was famished and, after all, dinner was at least 2 hours away. A few pretzels and maybe a jalapeno popper or two would hold me over nicely. He ordered a large pizza, onion rings, potato skins, and chicken fingers. For 4 people, one of whom had to leave in about 30 minutes. It felt a lot more like a dinner order than a few bar snacks. Whatever. I figured, I’d nibble on a few things and off we’d go to dinner. Not so fast. Lesson number one of working with this family is that leaving food on the table was as acceptable to them as it would be to an Italian mother-in-law. We finished it all. We walked out of the bar at about 7:30. I was feeling like it might be a good time to go back to the hotel and put on ESPN. We were on our way to dinner. The walk from the bar to Topolo was a short one and took us by a Ghirardelli’s chocolate and ice cream store. OK, fine, might be worth a mental note to stop in there after dinner (wait, didn’t I just have dinner….oh right, that was just a snack). That’s not how we played it. Jake got all excited because last time he was in Chicago, he’d gone to Ghirardelli’s and had the best malted of his life. We had 30 minutes to kill between a 1200 calorie snack and a huge Mexican dinner. 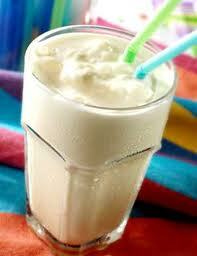 What better way to spend it than having a large vanilla malted. Yes, I’m serious. He insisted that the 3 of us go in and have malteds. Don’t worry, he assured us, his parents are usually late so we have plenty of time to get to Topolo. Enough time? Are you serious? I was worried about needing gastric bypass at this point. Nonetheless, we each had a large vanilla malted and then it was dinner time. Quick recap. It is now about 8:15 PM. I’ve had, in round numbers, 2 big slices of pizza, a few potato skins, some onion rings, a bunch of chicken fingers, and a large vanilla malted. And, it’s time for dinner. At a Mexican restaurant. A really good Mexican restaurant. Think about one of those meals you’ve had where you walked out of the restaurant thinking, “Why, oh why, did I do that? I feel stuffed and it’s going to take me 3 days to feel right again.” Only, I was walking INTO the restaurant feeling like that. And, I had no idea the fate that was about to befall me. If I had, I would have made a run for it. For starters, I got seated next to the CEO’s wife. Think: Jewish grandmother. I quickly realized I had no control over what was ordered (the entire menu) or what I consumed (everything put on my plate by someone else). While it was undoubtedly the best Mexican food I had ever eaten, I was getting through it only by constantly reminding myself of the physiologic unlikelihood of my stomach actually bursting and spewing pescado verde into my peritoneal cavity. The only guy who seemed to be suffering more was our guest of honor. Oh yeah, did I forget to mention that this was, at least in theory, a “business dinner?” We were joined by a guy named Per, who had flown in that day from Sweden to talk about doing a deal with our company. 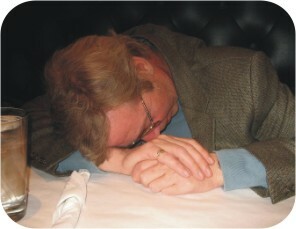 Poor Per was unthinkably jet lagged and had no idea what he was getting himself into with this dinner crew. We quickly exhausted all the options on the Topolo menu. No hyperbole; we literally ordered the entire menu, including every dessert. After dessert, we noticed that there were several unique looking tequila bottles on display. Jake asked about them and was told that they were all quite rare. So rare, in fact, that they cost $250 PER SHOT. So, naturally, he ordered a few shots of each so everyone could have a taste. Time for another quick dining recap. It is about 11:30 PM. I had by then eaten pizza, fried chicken, onion rings, potato skins, a few beers, a large vanilla malted, an indescribably huge Mexican dinner, dessert, and a some very rare tequila. I was teetering very close to death by food overdose. You’d think this would be enough, right? Good time to stagger into a taxi and limp back to the hotel and fall deep into a food coma. Wrong. The chef who owns Topolo also runs a more casual Tex-Mex restaurant called Frontera Grill. 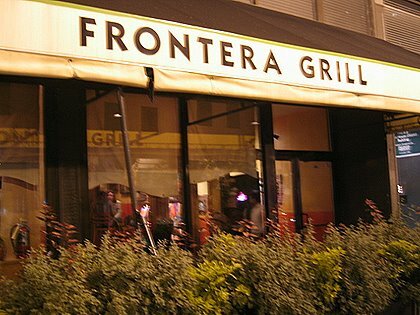 The CEO’s family had eaten there on a prior trip to Chicago and all throughout dinner they had asked if they could order off the Frontera menu since the two restaurants were literally next door to one another. The waiter refused this request repeatedly since the two restaurants are separate with different kitchens, etc. However, by the time we started ordering a few thousand dollars worth of after-dinner tequila, the waiter realized this was going to be the biggest tip of his career and he acquiesced to letting us order off the Frontera menu. It probably helped that it was closing in on midnight and all other sane diners were long gone. So we did what anyone would do if given the opportunity. We ordered an entire second dinner from the Frontera menu. That’s right, appetizers, entrees, and desserts. Start to finish, all over again, save the expensive tequila. Opting out was not a consideration. 1 AM Dinner Update: Pizza, fried chicken, onion rings, potato skins, a few beers, a large vanilla malted, one full high end Mexican dinner and dessert, one full Tex-Mex dinner and dessert, and a few sips of outrageously expensive tequila. I looked over at our Swedish friend and was absolutely convinced he needed an ambulance. The CEO and his wife got up from the table, thanked us all for joining them, but said they were tired and wanted to go to their hotel. Uh, yeah, that’s kinda where I was assuming the hearse would take me now too. Once again, not so fast. As the CEO and his wife left, Jake turned to Per and said, “So, how do you think our two companies can work together?” That’s the last thing I remember. I doubt Per even remembers that. This entry was posted in Uncategorized and tagged chicago, food coma, foodie, frontera grill, topolobampo, wrigley field. Bookmark the permalink.